Search Engines have come a long way in the last decade from the simple keyword matching algorithms in the early 2000s to the intelligent conversation-aware engines of today. 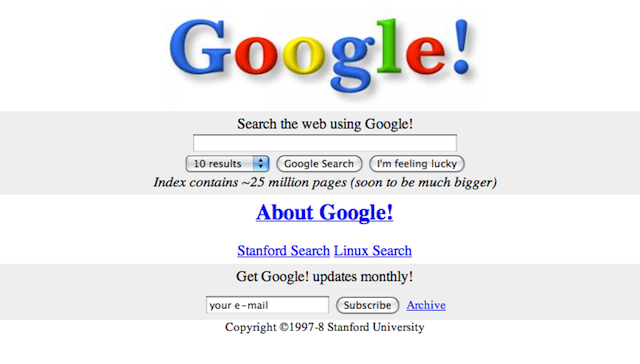 Google had its IPO exactly a decade ago in August 2004, and despite piloting some major projects such as Android, Maps and YouTube to success, it still remains focused on Search today. During all this time, Google has achieved a lot of milestones, and here are 10 of the most noticeable ones. The 10 milestones were posted by Google's Amit Singhal, who has worked there since 2000. According to him, Google has made 890 improvements to search in the last year alone! And there's obviously a long way to go. But take a look at what Singhal thinks are Google's 10 biggest achievements from the past 10 years! Auto-complete predicts the most likely words and phrases that you're going to type. And with Google Instant, you can see search results loaded instantly - so you can quickly get to whatever you're looking for. Google Translate was barely a beta product ten years ago. Today people use it in 80 languages to do over a billion translations a day. Google ist unglaublich! Search used to be just about webpages, but the Google Maps team has made it possible to search the real world too. Now you can ask, “How far is it to Santa Cruz?” and with one tap you can open walking, biking, public transit, or driving directions—with the fastest route so you avoid traffic. Users aren't always looking for textual search results. Google has blended together different type of search results - from images and videos to books and scholarly articles so you get the most relevant info, whatever the format. Google adapted Search to all types of mobile devices, which included redesigning their mobile products to facilitate faster typing for quicker results. Gone are the days of typing queries as clunky keywords—you can now ask questions by voice in the Google Search app. Instead of typing [weather chicago], just say “Ok Google, will I need an umbrella tomorrow?” Years of research have been invested into speech recognition and natural language understanding, and voice search works in 38 languages today. With the Google Search app you can quickly text, email or call someone without digging and typing. Just say: “OK Google, send an email to John” You can even set sophisticated reminders like “Remind me to pick up groceries tomorrow noon," and Google will buzz your phone at the specified time. Google built the Knowledge Graph to show how things are connected—ask “How tall do you have to be to ride the Cyclone?” or “Who’s in the cast of Guardians of the Galaxy?”, and then click to explore across the web. If you’ve got a flight reservation saved in your Gmail, you can ask the Google Search app, “What gate does my flight leave from?” and get the answer directly. If you have the Google Search app on your phone, you’ll get automatic help with everyday tasks. Google can automatically show you your plane, bus, and train reservations right when you need them. Google certainly has done a lot of work to get inside English dictionaries. But there's a long way to go still, as it is nowhere near perfect. Who knows what we'll see in the coming years? To quote Singhal, "In 2024, the Google of 2014 will seem ancient, and the Google of 2004 prehistoric."